Some individuals achieve a huge amount, yet are taken from the world at a terribly early age. This article looks at seven people - some better known than others - who passed away in 2014, having left a beneficial mark on society or culture despite having had precious little time. When California-born Sharp was in his late teens, he was diagnosed with Ewing's sarcoma, a form of bone cancer. Because his doctors weren't optimistic, he was contacted by the Make-A-Wish Foundation, a not-for-profit organization which helps make the dreams of seriously-ill children come true. Sharp was passionate about country music, so the foundation introduced him to record famed producer David Foster. A few years later, after Sharp's cancer was in remission, he teamed up again with Foster. By this time, the singer was permanently bald. Significant commercial success eluded Sharp, despite releasing three albums as well as a dozen singles, including She Sure Taking It Well (video below) between 1996 and 2011. In recent years, Sharp devoted a lot of his time to the Make-A-Wish Foundation, serving as a spokesman and writing an inspirational book. His death at the age of 43 was the result of complications from earlier cancer-related surgeries. Lauded as her generation's finest social innovator/social entrepreneur, Texas-born Stanford University-educated Haji is best remembered for co-founding and then holding the CEO's post at SaveUp Inc., an organization which aims to encourage saving by offering prizes including a monthly US$2 million jackpot. These prizes either come from sponsors such as Virgin America and Banana Republic, or are paid for using revenues generated by referring customers to financial institutions. Haji (who outlines the ideas behind in SaveUp in the video below), died of a pulmonary embolism. She was just 44 and the single mother of two infants. Khan (pictured left) was a frontline doctor. Not in a war zone, but in the ongoing battle against the Ebola virus in West Africa. A virologist trained in Ghana, he had treated well over 100 Ebola sufferers in his native Sierra Leone before he started to show symptoms of the disease, which kills at least 60% and often 90% of those who contract it. Khan, who was born in 1975, died in a special Ebola ward run by the international charity Medecins Sans Frontieres. He wasn't the first health worker to succumb during the epidemic, and surely won't be the last, as the virus spreads easily via blood, saliva, urine and even sweat. Hospital staff therefore wear full overalls, masks and gloves when treating Ebola victims. Born Kwon Ri-se in an ethnic Korean family in Japan, RiSe was educated in Japan before relocating to South Korea. There, her singing and dancing skills and cute looks soon led to a career in entertainment. As a member of the K-Pop girl band Ladies' Code, she was enjoying an impressive run of successes when the van the group was traveling in crashed in Suwon, south of Seoul. The van, it was later determined, had been traveling well over the speed limit in rainy conditions. It appears neither RiSe nor her bandmate EunB, who died before reaching the hospital, were wearing seatbelts at the time of the accident. RiSe was just 23 when she died of her injuries, four days after the accident; EunB was a year younger. A hugely popular musician in his native India, but little known in the rest of the world, Shrinivas was 45 when he died suddenly. His passing, eight days after a liver transplant, came as a shock because he had always followed a teetotal, non-smoking and vegetarian lifestyle. He was a pioneer because he played traditional Carnatic music (the classicial music of Southern Indian culture) on a mandolin, a Western instrument not previously used in the genre. Music critics noted that, thanks to Shrinivas, the mandolin was accepted by traditionalists within a few years, in contrast to the century it had taken for the violin to be regarded as a suitable instrument for Indian classical music. Among the Western musicians he performed with were John McLaughlin (of the Mahavishnu Orchestra) and Sweden's Jonas Hellborg. A high school English teacher who continued working for six years after he was diagnosed with brain cancer, Menasche was forced to quit the classroom when his illness took a dramatic turn for the worse shortly before his 40th birthday. Resolving to meet up with some of his former students before his condition further deteriorated, he embarked on a trip around the USA, curious to know what difference if any he'd made to their lives. He wrote about the trip, and how he felt about his mortality, for CNN's website. 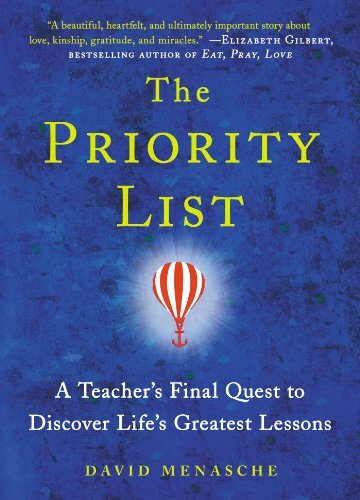 He compiled the wisdom he accumulated along the way in a book published at the beginning of 2014, The Priority List. On Amazon, it's plugged as "a remarkable book of insights that explores many of life's biggest themes, such as love, wealth, family, ambition, and friends, and asks us all to consider what really matters." At the time of writing, the 135 reviews posted on Amazon had given the book an average rating above four stars out of five. There's also talk of a Hollywood version, starring and produced by Steve Carell, star of the US version of The Office and lead actor in Seeking a Friend for the End of the World. Hughes died playing the sport which made him famous, a sport which isn't usually thought of as dangerous: cricket. It's a sport played in relatively few countries, but in India, Pakistan and the Antipodes, it's very much part of the national fabric. The death of a prominent cricketer wasn't - in global terms - widely felt, but it was deeply felt. While batting in a game in Sydney in his native Australia, Hughes was struck on the neck, just below the ear, by the ball. The impact ruptured his vertebral artery, causing a massive bleed in his brain. It's an exceptionally rare type of injury with only around 100 previous deaths recorded worldwide, only one of which happened during a cricket match. He died three days before what would've been his 26th birthday, likely depriving the world of many years of fine sportsmanship. Even though his career was cut short, his name will likely be remembered for some time, as he remains the only Australian to score a century (100-plus runs) on his one-day international debut.